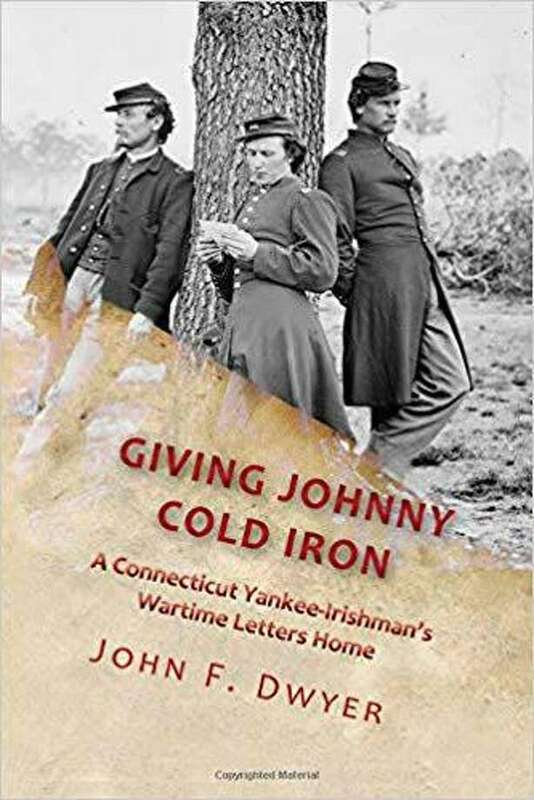 Gunn Memorial Library in Washington will present a visual program and book signing with author and Southbury municipal historian John Dwyer March 28 at 6:30 p.m. Dwyer will discuss and sign copies of his recently released book “Giving Johnny Cold Iron: A Connecticut Yankee-Irishman’s Wartime Letters Home” at the Wykeham Road library. Gunn Memorial Library in Washington will present a visual program and book signing with author and Southbury municipal historian John Dwyer March 28 at 6:30 p.m.
Dwyer will discuss and sign copies of his recently released book “Giving Johnny Cold Iron: A Connecticut Yankee-Irishman’s Wartime Letters Home” at the Wykeham Road library. When the Civil War began Frederick Gunn sought to prepare his students at the Gunnery in Washington for service in the Union Army and is credited for successfully inspiring a number of them to enlist. Dwyer’s book tells the story of one of these soldiers, John O’Brien, as deduced from a study of the numerous extant letters which he sent from the battle-lines. Dwyer supplements these letters with historical findings of the man, the letters’ recipient and their close family relationships that are frequently mentioned. The collection is rounded out with historic photographs of many of the subjects—the families, the people, the places and events—hoping to heighten intimacy with the story. The book is both military history plus family and genealogical research. Dwyer grew up in Washington. Upon completion of his college studies he embarked on a long career in Food Science as a technical marketing and sales manager. His interest in history was influenced by his mother’s long-time passion for genealogy. The restoration of his antique home in Southbury was recognized with a Merritt Award from the Connecticut Trust for Historic Preservation. Dwyer’s previous presentation at The Gunn Library was a program of 19th century songs as performed on his hand-crafted reproduction musical instruments. The program is free but registration is required by calling 860-868-7586.